Plants. We tend to take them for granted – a part of the landscape. On safari, a good shade tree has its worth, especially in the hot and arid hinterlands… but how many travellers know of the floral diversity of Namibia’s northwest and look out for its many proponents as they navigate rugged tracks through spectacular landscapes searching for wilderness experiences? 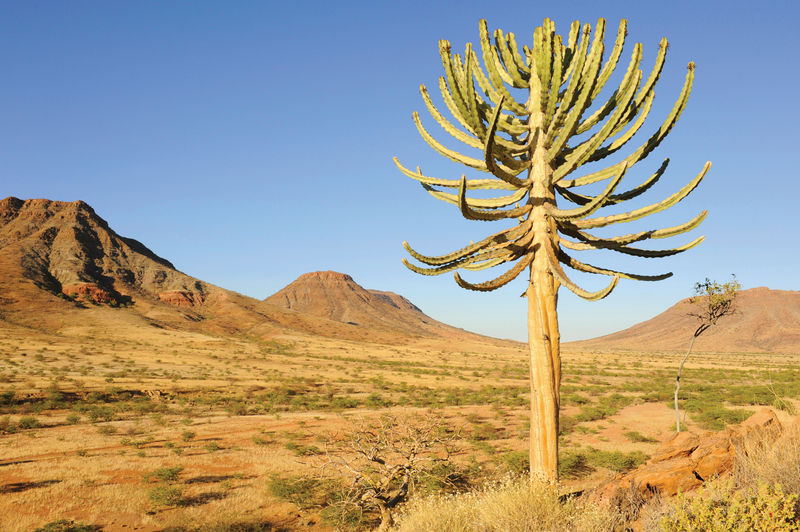 The entire Namibian escarpment, which stretches in a ragged, rugged, sometimes broken line across the length of the country and beyond it, is a broad band of terrestrial endemism. That means that many of the lifeforms of this area have evolved to become unique and occur only here and nowhere else on Earth. Numerous species of birds, reptiles and mammals are endemic to the Namibian escarpment. 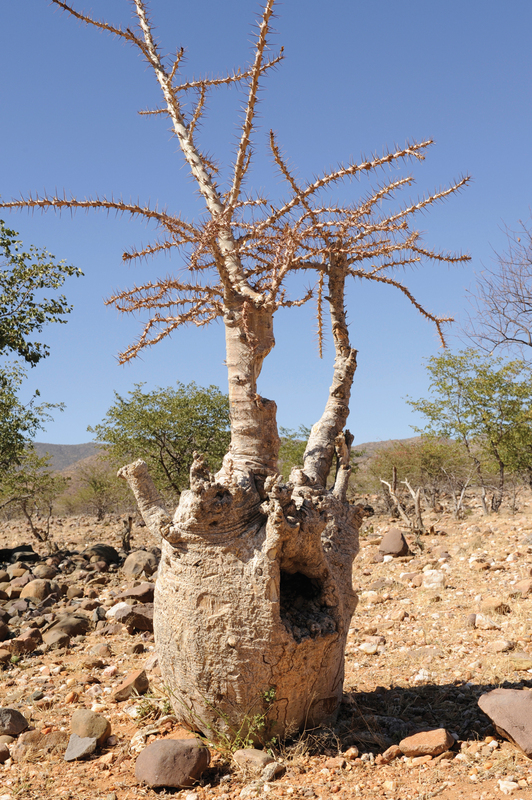 Yet, (not counting insects) plants offer the greatest number of uniquely Namibian – and often uniquely Kaoko – species. The ‘Kaoko Floral Diversity Conservancy Side-Track’ focuses on some of these, as well as other fascinating features of the Orupembe and Sanitatas Conservancies. Conservancy Side-Tracks are newly-established tourism routes that have been developed to enhance visitor experiences in communal conservancies. The routes are identified in collaboration with the local communities, giving them a more direct stake in guiding tourism traffic onto preferred, locally authorised tracks. The proceeds from the sale of the Side-Track route brochures (available in Windhoek, Swakopmund and in the Orupembe Conservancy) are reinvested into community conservation initiatives. The routes encourage local exploration, rather than simply rushing from one celebrated destination to the next. The Orupembe and Sanitatas Conservancies and adjacent areas are considered a localised hotspot of particularly high plant endemism. Some species are known from only here. Between 25 and 35 endemic or near-endemic plant species have been recorded for the area. Near-endemic means that the range of the species does not fall entirely within Namibia’s borders – animals and plants pay scant attention to such man-made delineations. The species are endemic to this special part of the world, but range marginally into Angola, where the habitat remains similar for a good northward stretch. As most of this distinct zone of biodiversity falls outside national parks, communal conservancies and community forests take on the vital role of ensuring sound management of natural resources here. A community forest in an area without actual forests – or even particularly many trees – may seem like an incongruity. The name is misleading. It’s not just about forests, or even only trees. All plant resources fall under the auspices of the Directorate of Forestry within the Ministry of Agriculture, Water and Forestry. By registering an area as a community forest, local residents in communal areas have a legal mandate to manage these resources. Both the Orupembe and Sanitatas Conservancies have also registered their areas as community forests and thus manage both the plant life and wildlife of their land for the common good. 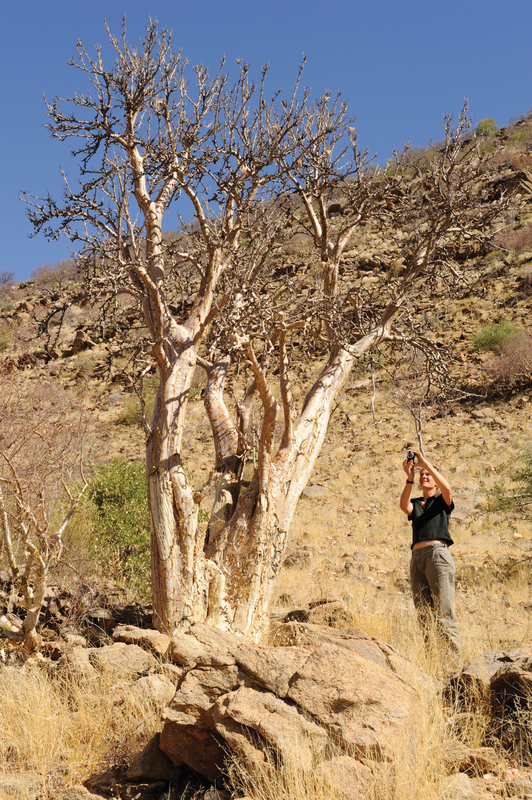 In many places in the arid northwest, the harvesting of resin from Commiphora wildii trees is particularly important. Known as omumbiri, the resin has been used as an ingredient in Himba body rubs and perfumes for countless generations. In recent years, it has attracted the interest of international cosmetic companies, which now use omumbiri in their products. Himba women harvest the resin for commercial sale and this provides important cash income to their households. The trees are not harmed by the harvesting as the resin is exuded naturally, making this one of the truly sustainable local resource uses. Many of the plants found along this Side-Track route are not just unique, but also visually stunning. Kaoko tree-euphorbias stand like sentinels on hillsides. Numerous Commiphora species, most prominent amongst them the purple-stem corkwood and blue-leaved corkwood, add character to the landscape with their gnarled and striking forms. Moringas, sesame trees and bottle trees draw attention, each with their own unique, heavy-set form. And the baobab, that most revered of Africa’s trees, towers over the land in several places along the route. 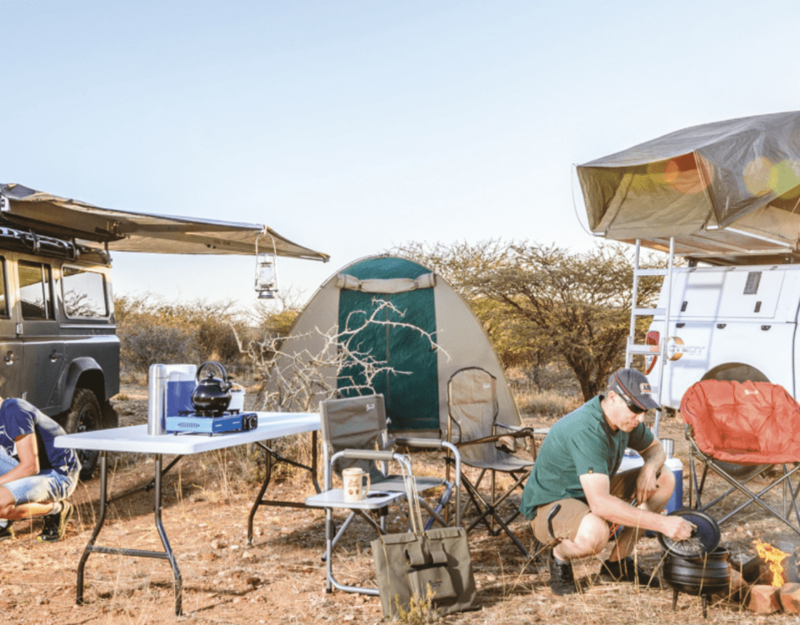 The House on the Hill and Marble Campsite, as well as the Etaambura Camp, all located near the small settlement of Onyuva along the route between Orupembe and Rooi Drom, offer great options as a base from which to explore the area for that extra day. The whimsically-named House on the Hill provides creatively-appointed, self-catering stone cottages. Etaambura Camp, set on a rocky ridge affording incredible views in all directions, is an equally stunning self-catering choice. All three enterprises are operated in collaboration with the Orupembe Conservancy, with Etaambura actually being owned by a consortium of conservancies including Orupembe. The Kaoko Floral Diversity route is a full-day, four-wheel-drive route that can be considered moderately challenging for novice four-by-four drivers. Vehicles with a good ground clearance are a must, as the route traverses steep, rocky sections. The full-colour route brochures that define the trails include a highly-detailed map to enable accurate navigation. You should, however, have a GPS along to check your location and verify turn-offs. The main route is a little over a hundred kilometres long, so a full day is certainly needed to really enjoy it. While there is a shorter route through rugged hills and valleys, it is a more difficult and indistinct track that may be washed out in places; a full day should still be planned for the 75 kilometres. You don’t have to be a botanist to enjoy this route. The floral diversity is just one facet. Searching for Namibia’s near-endemic birds is particularly rewarding here, too. At least eight of the dozen plus Namibian near-endemics are regularly encountered. For many, the spectacular landscape will be reward enough for the day’s four-wheel-driving. The track also passes numerous Himba settlements, giving insights into this unique culture. And, though not abundant, there is large wildlife. Giraffe roam here, as do gemsbok, springbok and Hartmann’s mountain zebra. The fortunate may glimpse elephant, lion, leopard or cheetah, although these are rarely seen in this sector. Of all of the diverse features of the route, sunrise and sunset over the Onyuva plains may instil the greatest sense of quiet awe in conscious travellers. Namibian book stores stock a variety of wonderful field guides and photo books to help identify and enjoy Namibia’s biodiversity. Of particular interest for this area are the field guide Trees & Shrubs of Namibia and the photographic celebration Birds of Namibia – A Photographic Journey. 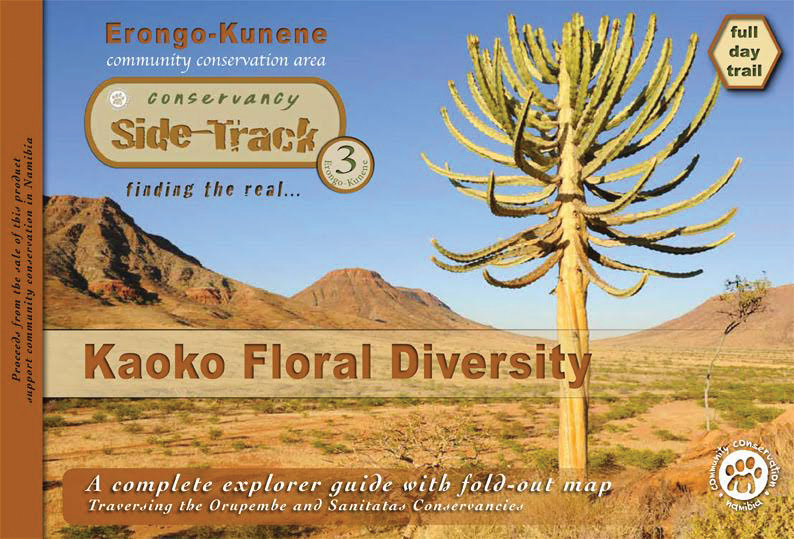 Conservancy Side-Track route brochures are available at CYMOT outlets in Windhoek, Swakopmund and Otjiwarongo, and selected accommodation establishments in conservancies. For more info visit www.nacso.org.na.